2-D is the virtual alter-ego of Damon Albarn, and serves as the lead singer and keyboard player of the band. 2-D’s speaking voice for all extra material was provided by actor Nelson de Freitas until 2007, after which Kevin Bishop was cast. Murdoc Niccals is loosely based on the infamous Keith Richards, and apparently provided most of the foundation for the band’s conception. 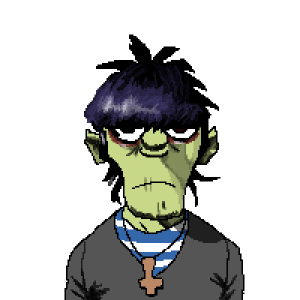 Niccals was jailed at the beginning of 2018 for a crime that he claims to be innocent of, and was replaced by a character called Ace for the band’s sixth album. Noodle is the lead guitarist of Gorillaz, and occasionally provides lead and backing vocals. She is of Japanese origin, never shows her face in photos, and has been previously voiced by actress Haruka Kuroda, singer Miho Hatori and musician Tina Weymouth. Russell is the drummer and percussionist of the band. His voice is provided by Remi Kabaka Jr, and he has previously taken inspiration from such rappers as Del the Funky Homosapien. Hobbs’ origin story is perhaps the most intriguing of the collective, as one particular incident from his past has left him subject to possession from the ghosts of his dead musician friends, deepening his musical abilities.